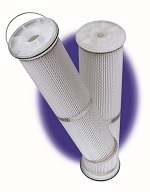 The filtration setup that results in too much downtime can be costly for many reasons. Our new generations of PLEATED BAG elements result in fewer bag change outs, less downtime, and longer cycle times. 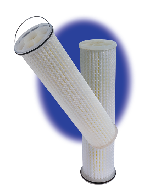 These pleated liquid bags in shape of cartridges are designed for applications requiring nominal filtration media between 1 and 200 microns and absolute filtration media between 1A and 40A micron. In order to gain some perspective, a nominal standard size #2 bag has 4.4 square feet of surface area, whereas the pleated liquid bags have 22-44 square feet in nominal felt configuration and 35 square feet in absolute rated configuration depending on the micron. Therefore, these bags have 5 to 10 times more surface area than the regular size bags and consequently last that many times more per application, which ultimately reduces the downtime of having to replace filter bags during your filtration process. The standard X01 filter bags has 2 square feet of surface area compared to 16-25 square feet of pleated bags, depending upon the micron rating. Pleated bags do not require any adjustments to the current filtration setup, they simply replace the bag and basket design and fit directly into the housing. Please choose NOMINAL or ABSOLUTE pleated bag option, when you are directed to the particular style bag, choose the Micron rating you need, then the Material (Polyester or Polypropylene), and then choose the desired length (X100, #1 or #2), finally choose the type of flange that will match your application. Please note: Standard packaging is 4 per case with a minimum order of 2 (which is a 1/2 box quantity).